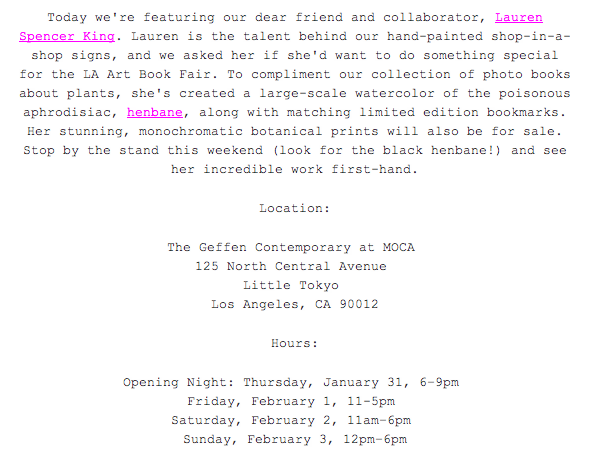 I am just over the moon about being a part of Book Stand at the LA Art Book Fair this weekend at MOCA! The fair is hosted by one of my favorite book stores, Printed Matter, the worlds largest independent non-profit organization dedicated to the promotion of publications made by artist. 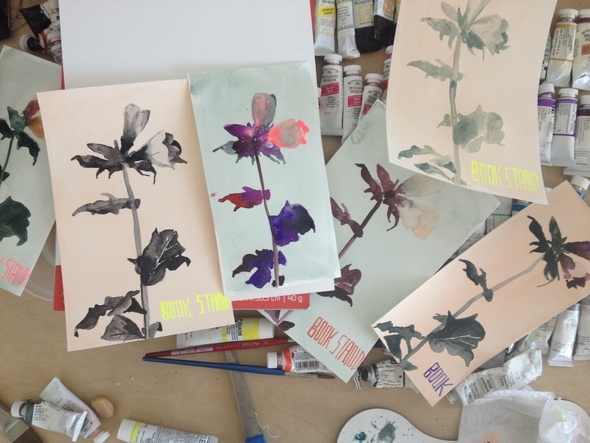 Stop by Book Stand's table to see a special collection of books on plants, hand picked by Claire. She has also chosen a selection of original prints, weavings, textiles, collages all by artists that are featured in her shop, as well as an ikebana arrangement by Tigers to Lilies. I will have a few things there: a large watercolor of the plant henbane (this is an amazing plant that is both an aphrodisiac as well as very poisons, and good for treating scorpion bites, you can read more about it here) (color tests can be seen in the photo above), a limited edition run of a drawing, Keep Telling on Yourself, and custom bookmarks for Book Stand! Thank you Claire for inviting me to be part of this amazing weekend! wish i could be there. feeling inspired now seeing the watercolour paintings. thanks for sharing! Your bookmarks are so beautiful! Hope I can make it!